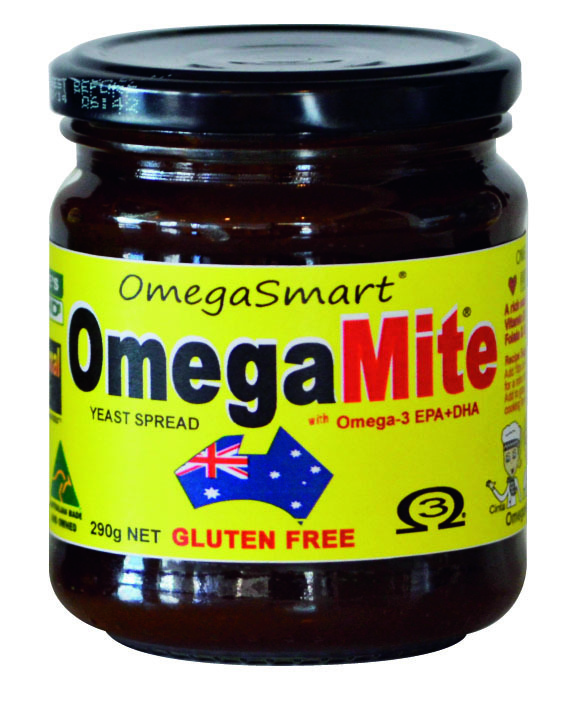 OMEGAMITE® "MegaMite®" "DYNAMITE® Taste" - Australian Made HEALTHYMITE®! Purchase 3 jars for FREE delivery in Australia. Otherwise $10.00 freight charge within Australia. Internationally Award Winning! "IT'S AUSTRALIAN AS! It's DYNAMITE® taste with the goodness of VitaminB, Folate, Gluten Free & Omega3! " OMEGAMITE® WINS SIAL SHANGHAI 2012 INNOVATIVE PRODUCT SIAL CHINA 2012 FOOD AWARD! OMEGAMITE® an Australian Yeast Spread wins SIAL INNOVATIION 2012 AWARD for INNOVATIVE PRODUCT SIAL CHINA 2012 at SIAL SHANGHAI China. OMEGAMITE® with Omega-3 DHA+EPA is an innovative World First developed in Australia by Nature’s Blend an Australian Owned Company. The Award was presented to Mark and Brenda Robinson from Nature’s Blend by Xavier Terlet from XTC World Innovations, President of the Jury and Aude Chabanier, Directrice Commerciale of SIAL Group. The SIAL SHANGHAI food expo was held in 6 halls and attended by 1,750+ exhibitors and 40,000 trade visitors from all over the world. The Award Winning DynaMite® tasting OMEGAMITE® was showcased throughout the event in the SIAL TRENDS and INNOVATION stand. OMEGAMITE® adds to the Nature’s Blend FUNctional FOODS OMEGA Gluten Free range which includes OMEGAHONEY®, OMEGASMART® – OMEGA® Peanut Butter, OMEGAMAYO® and OMEGAGOLD®. Omega Nutrients help promote Heart Health, Eye Health, Brain Health and Brain Development in children. The OMEGAMITE® Dynamite® taste makes it “SMART and TASTY”. The OMEGACHEF® and the OMEGAKIDS® makes it fun for kids to relate to the Omega Nutrients. OMEGAMITE® is the most FUN and EASY way to get your Omegas. Nature’s Blend are “Spreading the word on Omegas globally”. They are “Putting the FUN in FUNctional FOODS” while “MAKING GOOD FOOD BETTER. Thanks Nature's Blend. Your OmegaMite tastes Dynamite! I love your OmegaMite, the omegas idea in the food is great and makes it easy for the kids to get their omega 3. I also love the fact that it's low in salt so I don't have to buy a seperate product for the kids and they love the taste! My breakfast is healthier now with your OmegaMite on toast in the mornings. Great product, keep it up! Mei Lin.